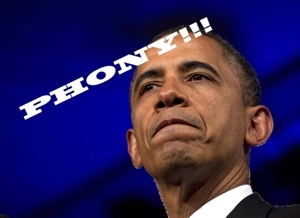 "Phony" is a good enough word. We've had phony beheadings, and phony murders going back to the early days of the Syrian war. We've had a phony video that supposedly, at least for a couple weeks, was the reason for Benghazi. In fact, we've had a "phony" war on terror altogether in the sense that we haven't, certainly under this President tried to win it, but rather only withdraw from it. We've had the phony excuse to release five of the most vicious Taliban and al Qaeda prisoners in exchange for one AWOL Muslim American soldier. We've had the "phony", "al Qaeda is on the run!" In fact we have a phony President that was elected the second time (if not the first) because of phony people showing up to vote. About the only thing not phony about Barry Soetoro (and his name is probably phony too) is all of his scandals, which he calls "phony scandals". Go figure. Glad to see Brit Hume stand up and tell the truth. -W.E. In the opinion of distinguished journalist Bret Hume, President Obama is conducting a phony bombing campaign against the ISIS terror army strictly for political advantage -- AND -- doesn't want it to succeed!